Frito Pie: How to Make the Original Chili Pie might be just the American recipe you are searching for. This recipe serves 8 and costs $2.08 per serving. One serving contains 334 calories, 12g of protein, and 18g of fat. It works best as a main course, and is done in around 15 minutes. It is perfect for The Super Bowl. It is a good option if you're following a gluten free diet. 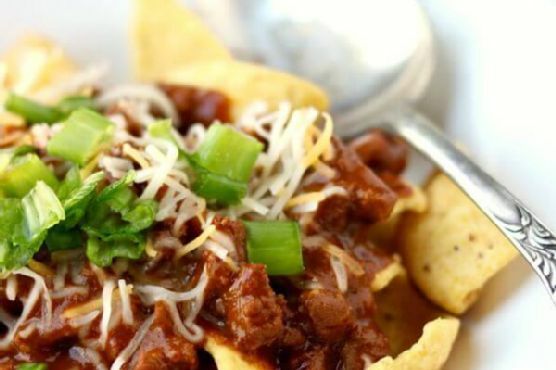 A mixture of wolf brand chili, fritos corn chips, cheddar cheese, and a handful of other ingredients are all it takes to make this recipe so delicious. To use up the onion you could follow this main course with the Candy Corn Cupcakes as a dessert. 1 person has tried and liked this recipe. All things considered, we decided this recipe deserves a spoonacular score of 4%. This score is very bad (but still fixable). Try Butterfinger Pie, Cherry Pie, and Blueberry Crumble Pie for similar recipes. Cava, Grenache, and Shiraz are great choices for Chili. These juicy reds don't have too much tannin (important for spicy foods), but a sparkling wine like cava can tame the heat even better. The Poema Brut Cava with a 4.2 out of 5 star rating seems like a good match. It costs about 11 dollars per bottle. Vibrant aromas of ripe peaches, pears and toasted bread with a hint of spice fill the nose. The palate is dry with a rich, creamy texture. Layers of flavor include orange rind and spice that persists through an elegant finish. Did you know you can freeze shredded cheese? If you don't finish it up, don't throw it out!